The Super Bowl Pool is our Club’s biggest annual drive to raise funds for The Rotary Foundation of Rotary International (TRF), whose mission is to enable Rotarians to advance world understanding, goodwill, and peace through the improvement of health, the support of education, and the alleviation of poverty. Every Rotarian around the world is asked to donate to TRF every year. Super Bowl Pool winners receive a Paul Harris Fellowship. 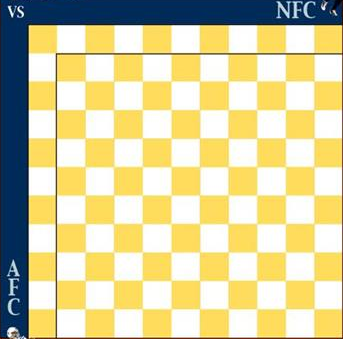 The Super Bowl Pool consists of a board with 100 squares: 10 across for the NFC team and 10 down for the AFC team, with the numbers from 0 through 9 randomly assigned across the columns and down the rows. You enter the Pool by making a donation of $110 per square. You can make as many $110 donations as you like. For each $110 donation you make, your name is placed in a square on the board. More than one name may appear in any one square. Winners are identified by the score at the end of each quarter of the Super Bowl on February 3 by matching the last digits of the scores with the appropriate numbers on the Super Bowl Pool board. Everyone whose name is in a winning square receives a Paul Harris Fellowship. The odds of winning are 4 out of 100 for each $110 donation you make. Why support the Rotary Foundation of Rotary International? Click on any of these causes to learn more. More complete information about TRF is available here. Half of the donations we make come back to our Club three years later, to support some of our major projects in San Francisco and around the world. Rotary's Vision for a Better World from Rotary International on Vimeo.